Just how many ingredients are listed on your yogurt label? 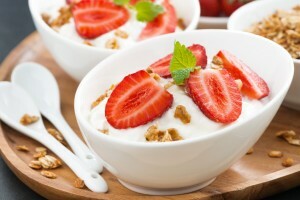 Yogurt is essentially a mix of two ingredients: milk (ranging from nonfat to whole fat) and live active cultures. When the label has more than those two ingredients, start asking yourself why? When it comes to yogurt, stick to the basics. The fancier a yogurt gets, the farther it gets from its intended purpose: to nourish your body. The main added ingredient to look out for is, surprise surprise, sugar! That’s right, these yogurts are desserts, not a healthy part of a nourishing meal. Fruit on the bottom? Dessert. Raspberry cheesecake or key lime pie flavored? Dessert (and an unhealthy one at that). What we really need to be happy, healthy individuals is a zero-tolerance policy on yogurt with added sugars. Even the most natural, healthy yogurt will have some sugar in it due to the naturally-occuring milk sugar lactose. However, as it ferments, the live active cultures in yogurt convert much of the lactose to lactic acid. When it comes to blood sugar, a high quality yogurt is a complete package with everything you need to keep your levels stable. Its rich protein content digests slowly and aids in appetite control. Look out for gelatin, artificial colors, artificial sweeteners, supplemental whey protein, or modified food starch (real yogurt doesn’t need wheat or corn in it!) It’s unnecessary. With every additional ingredient, you get one step further from the whole, unprocessed food. If you want a more interesting yogurt, add your own ingredients at home! Spice it up with cinnamon, nutmeg, or nuts and fruits. So we’ve just learned that the best yogurt for your body boils down to two main ingredients: milk and bacteria. (It tastes better than it sounds!) Yes, your yogurt is alive and that’s a good thing! Two of the most popular cultures included in yogurt are Lactobacillus and Streptococcus. When it comes to your immune system, your body is not alone. You have trillions of tiny little helpers colonizing in the intestines. They can also influence our metabolism and regulate digestion. Probiotics have even been shown to improve athletic performance by enhancing recovery from fatique, boosting immunity, keeping the GI tract healthy and reducing susceptibility to respiratory tract infections. When it comes to live active culture content, think big! 1,000 bacteria/gram may sound big but it’s not worth settling for! Shoot for at least one million live active cultures/ gram yogurt. If you find the Live & Active Cultures seal on your yogurt container, it has been approved by the National Yogurt Association for having at least 100 million cultures per gram at the time of manufacture.